We encourage pupils across the school to take pride in their appearance and to value the sense of identity that their school uniform provides. Mrs Brookes seeks to offer excellent service so appointments can be booked with her by telephoning 01833 638103. Orders can also be placed via Brookes online. Sportswear must be ordered from PlayerLayer.com. Please also note that in addition to the compulsory PlayerLayer kit, optional sports items may also be purchased from the PlayerLayer website. Standard items (marked ‘other’ in the uniform list) can be purchased from any retailer. While pupils who are new to the School are encouraged to visit Brookes Outfitters for a fresh uniform, Barney Friends volunteers run a useful as-new shop for replacements and spares. Anybody wishing to sell good quality second hand uniform may leave bags at the shop or in the Senior School General Office at any time, clearly marked with your child’s name and, if possible, their school number. Parents have the option to donate their items, with all the money made kept by the shop and given to charity at the end of the year. Parents wishing to sell items receive 70% of the selling price, which is refunded onto the termly school bill. The remainder is kept by the shop to be donated to charity at the end of each academic year. The shop also offers a rugby boot exchange – it costs £2 to exchange for a clean old pair or £5 if you have none to give in. The shop is currently located in Longfield Lodge and is open every Friday from 3.00pm-5.00pm. Payment can be made by card, cash or cheque and parents of boarders may add the cost to their school bill. Unfortunately, the shop is unable to offer refunds. All uniform items and equipment must be clearly marked with the pupil’s name and initials (plus school number for boarders). Precise games kit requirements will vary according to the season and to the sports which any individual pupil may be playing. If parents are in doubt, they are urged to seek advice from games staff. All rugby and hockey players are strongly advised to wear shin pads and a mouth guard – advice should be sought from your dentist. The school provides an opportunity to purchase mouth guards at the beginning of the Michaelmas term from TitanGuards, through our partnership with them. Follow the link here for further information. Football players must wear shin pads. Squash players are strongly advised to wear protective goggles – Mr Gedye can advise on 01833 690222. School uniform is worn throughout the working day (and on the journey to and from School if your child is a day-pupil). The Uniform List listed below is also displayed on the School website. 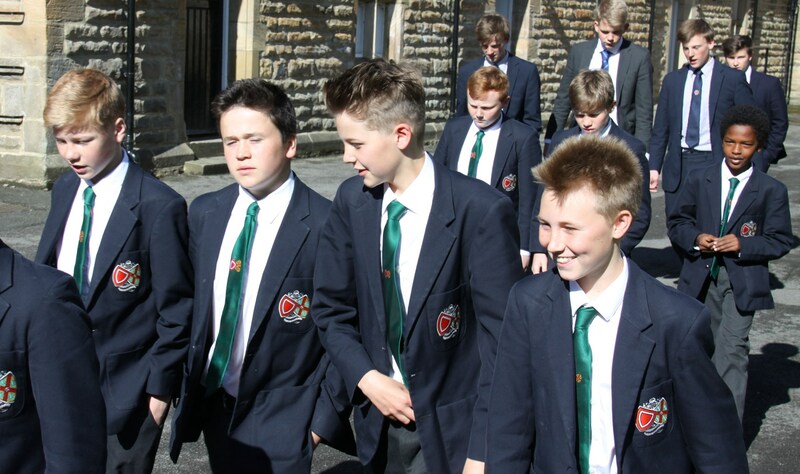 Uniform for Years 7 – 11 is sold by Brookes Outfitters in Barnard Castle. Appointments can be made for complete outfitting on 01833 638103. Alternatively you can view the uniform range at www.brookestailors.com and buy online. Day pupils will need a bag or briefcase to carry things to and from School. Students will need to bring their own pens and pencils, and they may wish to arrive equipped with a scientific calculator and geometry (mathematical instruments) set. Otherwise these can be obtained cheaply from the Bookroom (previously mentioned). If students are coming from overseas and English is not their first language, they will need a dictionary explaining words from their own language into English. Dictionaries should be in book format and not electronic because these are permitted in class but not in examinations. Otherwise, all necessary text books, exercise books, files, writing paper and notebooks, including homework (or ‘prep’) diaries, will be supplied by the appropriate teacher during the first few days, and replacements can be obtained from the Bookroom. Boarders wear casual clothing in the evenings and at weekends. Smart casual clothes are required for most Chapel Services which typically is a collared shirt and trousers (not jeans) for boys and a collared shirt or blouse with a skirt or trousers (not jeans) for girls. Items of School uniform should not be worn in Chapel on Sunday unless the dress code is uniform. Boarders can obtain a ‘chit’ from their Housemaster or Housemistress to buy uniform items which can be charged to the end-of-term bill. All clothing items must be clearly marked with the pupil’s name and initials (plus school number for boarders). This allows its identification, especially after laundry. Precise games kit requirements will vary according to the season and to the sports which an individual pupil may be playing. If parents are in doubt, they are urged to seek advice from the Games Department at the School. Joining the Sixth Form is a significant milestone in their progression through education and into adulthood, and the School is keen all our Sixth Formers look, feel, and act like adults from the off. One of the most significant differences between the Sixth Form and the lower years is that Sixth Formers wear fitted suits supplied by Slaters of Newcastle, the School’s tailor, rather than the school uniform worn previously. The guiding sentiment for Sixth Form appearance is that it reflects well upon themselves and the School, and that it is consistent with smart professional dress. Suit alterations are carried out free of charge by Slater’s of Newcastle after initial fittings. We strongly recommend this service is used to ensure long life of the garment. The school is very keen to present a corporate look, and regrettably, we are unable to allow Sixth Formers to wear suits supplied by tailors other than Slaters of Newcastle. Other school items, in particular House ties, should be bought from Brookes Outfitters in Barnard Castle as usual. Initial fittings for suits will take place during the Sixth Form Induction days. During these days, the students will be able to see samples of the suits on offer, and will have their measurements taken by fitters from Slaters. They will need to indicate the colour of suit(s) that they wish to purchase, and the number of additional pairs of trousers, skirts, and waistcoats that are required. Also available will be dinner suits for boys (worn at an increasing number of Sixth Form events each term) and a selection of suitable shirts and blouses, but these are optional, of course, and can be purchased from any supplier. Complete suits cost £110, to include jacket and skirt or trousers, and additional skirts, trousers, and waistcoats cost £35 each. The cost of the suit(s) will be added to the school bill for the following Michaelmas Term. All the suits are supplied as ‘separates’ and in 3 length fittings per size, so an ideal match of both jacket and trouser/skirt should be possible without alterations. In the very unlikely event that an alteration is requested, parents must be aware that from that point Slaters would not accept returns on the fitting day, and the garments will be chargeable. It is strongly recommended that, as a minimum, students either purchase a suit with an additional pair of trousers or skirt, or that they purchase two suits. The final fittings will take place on results day and the day that follows it. Slaters will bring all of the suits that were ordered during the induction days to the school for the students to try on. It is hoped that parents will be able to attend these fittings to ensure that they are happy to purchase the suit supplied. If the suits fit and all parties are happy, the suits can be taken away, ready to be worn at the start of term. If there is a problem, Slaters will have a small quantity of sizes on site, ready for instant swap outs. If the correct size remains unavailable then Slaters will send appropriate replacements to the school, which can then be picked up a couple of days later – certainly before the start of term. There will be no charge for size swap-outs, providing that no physical alterations had been made to the garments. If your son or daughter is attending the induction days, then they will be measured for a suit by the fitters from Slaters. The suit will be ordered, and will then be sent to your home address , location allowing (there will be a small surcharge for this). This will allow the suit to be tried on. If there is a problem with the fit, you should inform Slaters directly on +44 (0)191 232 5557 (please speak to Ray or Darren). They will arrange for a replacement garment to be delivered to the school before the start of term which can be picked up at your convenience. Providing that the original garment is returned unworn and that no physical alterations have been made, there will be no charge for size swap-outs. If your son or daughter is new to the school and unable to join us for the inductions days, you should contact the admissions secretary by telephone +44(0)1833 696030 or by email admissions@barnardcastleschool.org.uk for a Sixth Form Uniform Pre-Order Form. This should be completed at the earliest opportunity and returned to the Admissions Secretary. When your son or daughter arrives at the school they will be driven to Slaters in Newcastle as part of their Overseas Student Induction, where they will be fitted with a suit that they can take straight away. If your son or daughter requires an additional or replacement suit, then Slater’s will be happy to supply you with one of our uniform suits at any time of the year. Please contact them directly on 0191 232 5557, stating that you are from Barnard Castle School or visit their Newcastle Store.